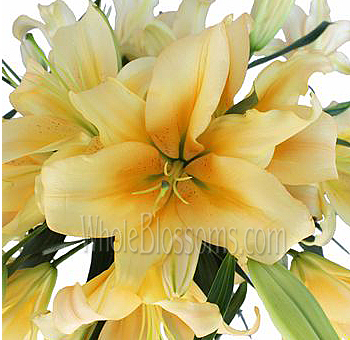 Lilies are an excellent choice for wedding flowers. We have a wide variety to choose from. They are large, beautiful star-shaped flowers throughout the world because of their colors, dazzling displays, and perfumed scent (depending on variety). Asiatic are mainly unscented varieties and have medium-sized upright-facing flowers. Oriental contains large-sized flowers and are popular for their strong perfumed scent. Please schedule your order to arrive at least 3-4 days before your event to enable the blooms to open. 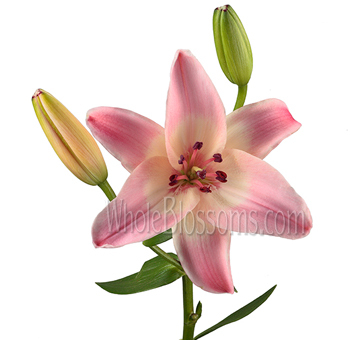 Please note that it is recommended that you remove the stamens from lily buds as they begin to bloom. This helps to extend the vase life and prevents the blooms and clothing from becoming stained. Be careful not to touch your clothes or rub the stamens against the fabric since they stain. They are available year round. 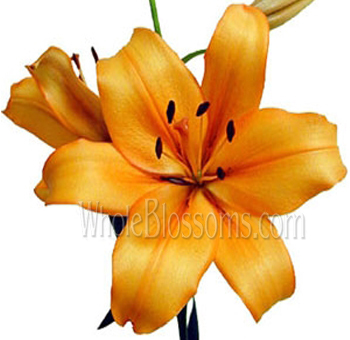 If you have seen the lilies, you know its sweet and enticing charm. The lilies are a group of 40 different types of flower. They are found in shades spanning the rainbow, with the exception of green. Anyone who sees them will fall for their soft charm! 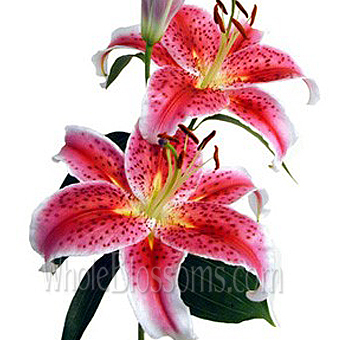 Lilies have been associated with the gods and with royalty since ancient Greek and Roman times. They stand for purity, wellness, and passion. 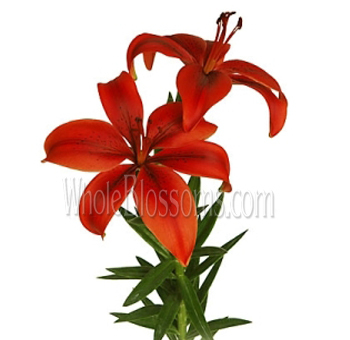 Lilies complement and enhance the look of a flower arrangement on the whole. Its curving shapes and gradient of colors give it incredible charm. These flowers are honestly a feast to the eye! 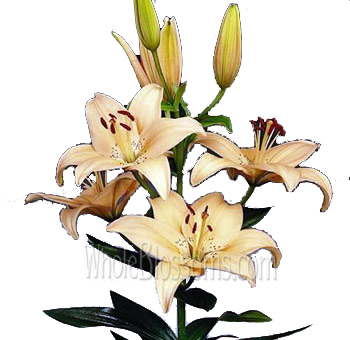 Lilies are perennial plants that come in several types. They grow in heights between 2 feet to 6 feet and have sturdy stems. They have bright stamens and filaments as well. The leaves grow in spirals over the stem. In a lily, the shades can shift beautifully from white to purple and red to orange on a single petal. They are sprayed with dots of lovely complementing colors. It is a marvel of Mother Nature to inspect lilies. Each flower looks like it was personally painted! Lilies are great for just about anything. They are most beautiful at a wedding or special celebration. 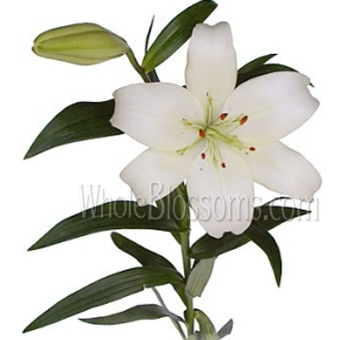 Almost all lilies come in white, which symbolizes purity. 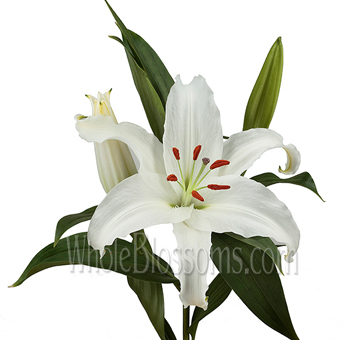 White lilies are perfect for a wedding occasion. The lily boutonniere is very popular as well. A pink, red or white lily will look great for this purpose. To decorate the wedding with centerpieces, purple lilies and blue lilies are a must-have. 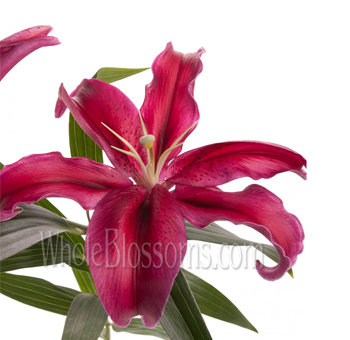 Pink lilies and red lilies stand for passion and ambition. These are a great gift to a colleague. 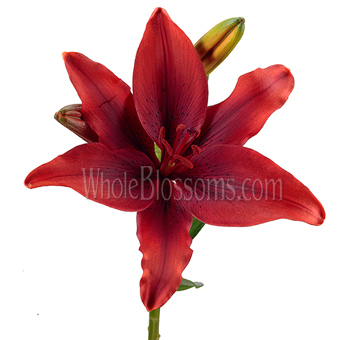 And if you are looking to propose to a special someone, red and orange lilies colors will do the job! It will stand for your love and appreciation. 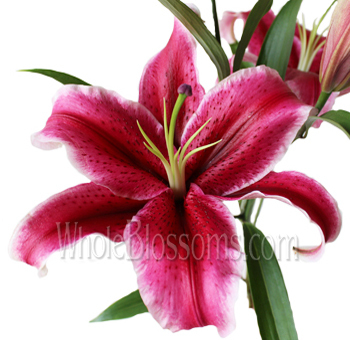 Most species of lily are fragrant and soothe the senses. 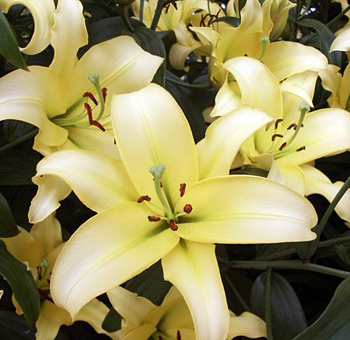 A bunch of deep yellow lilies symbolizes good health and healing. A bouquet of these should be sent to loved ones in difficult times. 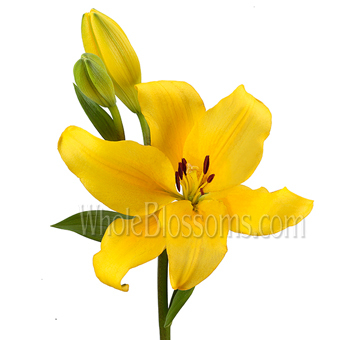 Yellow lilies will liven up your homes too. 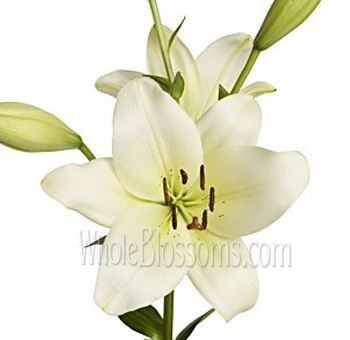 The Asian fragrant lilies will leave you with lingering good memories. 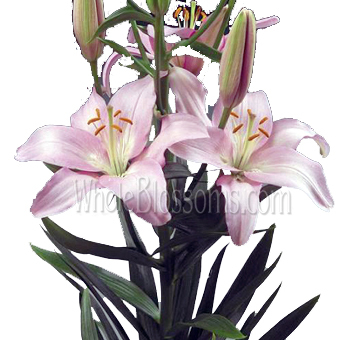 Lilies are commanding and elegant flowers. When used in a cluster together, they are a show stopper. 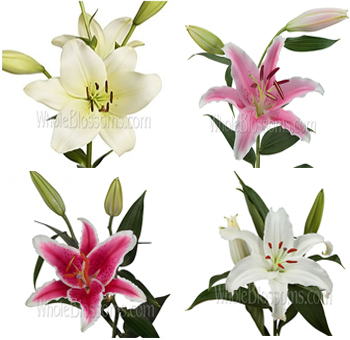 There are many types of lily available. 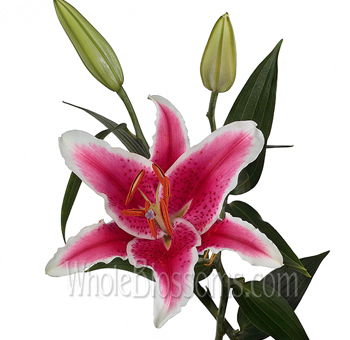 The Asiatic lily is a favorite type of lily. They come in bold and warm colors. A bouquet of dark orange ones can be paired with pink ones. They will look absolutely spectacular. 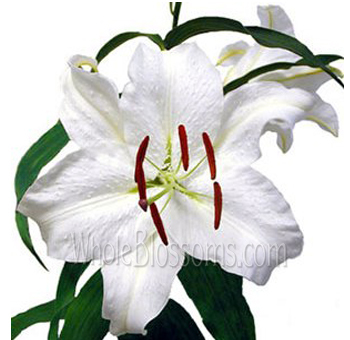 The Oriental lily, or Casa Blanca Lily, is another popular variety. This flower is tall, dazzlingly white and extremely fragrant. You should definitely choose these if you're planning a wedding! 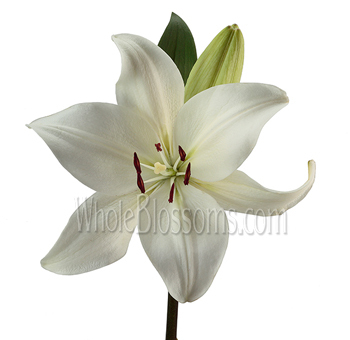 This white lily will look beautiful in a bridal bouquet. They will even suit the bride should she choose to use it in her dress! 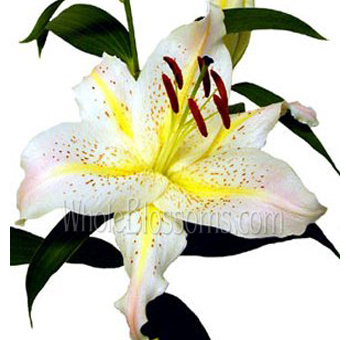 Then the sweet smell of the Casablanca lily will bring beautiful memories to your mind. 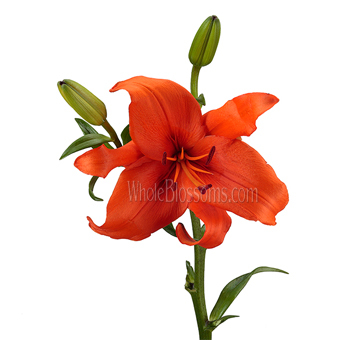 The Trumpet lily, also called the Aurelian lily, is another beautiful variety. It can grow to heights of 5ft, and its texture is waxy. 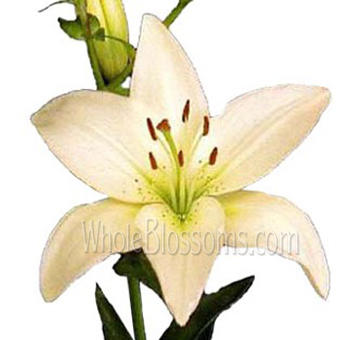 Trumpet lilies are white, and they will have a gradient of another color like pink or yellow. They are ideally suited for a vase with dark green foliage. The miniature lilies, or mini calla lilies, are another type of lily that comes in bright and warm colors. Their leaves are recurving, and the stems are short and sturdy. They look beautiful in a bouquet of other warm hues and broad green leaves. 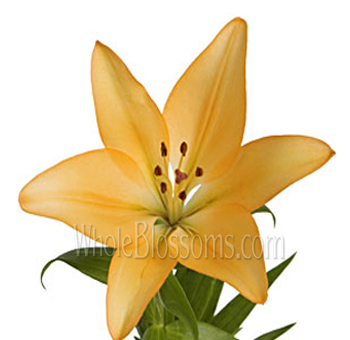 A bunch of miniature lilies in a small vase will bring out a beautiful splash of color. So, lilies look really great in a bouquet of their own. But they can absolutely be paired with other flowers of any shade! You can gift a mixed bunch to your friend to express your appreciation. Since lilies mean good health and passionate drive, these are well-suited to encourage loved ones to achieve their dreams. Lilies complement flower arrangements so well. 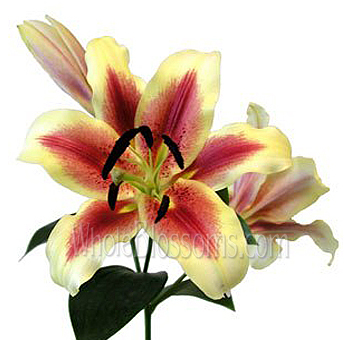 Just a few lilies with dark-colored roses and bright daffodils will look amazing. White lilies will be enhanced by red and pink daisies. 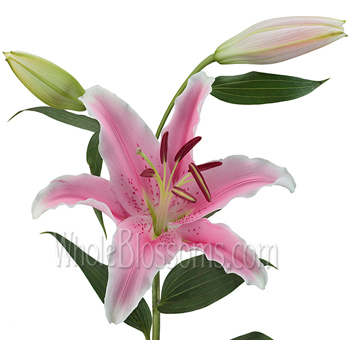 The lily flower will transform any ordinary bouquet into a centerpiece. They command attention with a sweet charm, which makes them irresistible and a great choice for bouquets. To buy the best and brightest lilies, you should try experienced florists. You will require freshly cut blooms that have been tended to with care. In this way, you can be sure the colors and bloom of your lilies will last long. A florist you can absolutely trust is Whole Blossoms. 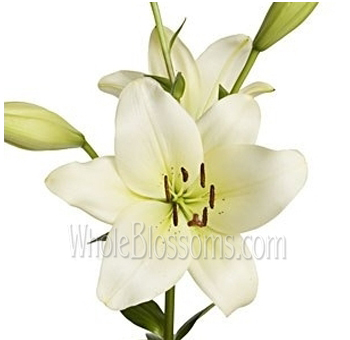 You can order lilies from them in bulk, and they will be delivered to your doorstep 24/7. Their quality is amazing. It befits a flower like the lily. Go on ahead and order some yourself!